If the moon's gravitational effect on Earth's oceans counts as waterbending, then the Sun's fusion counts as firebending. Thus firebending was happening long before waterbending. As I said in my last post, it's also possible that the Dragons learned to Firebend from the Sun. As long as we're assuming things, I claim that it's safe to assume that Dragons have existed long before humans, being an ancient race and all. Therefore, before any humans could look at the moon, Dragons were firebending and Firebenders could have learned firebending just as quickly as waterbenders. I'm not trying to say that the waterbenders didn't have the first Avatar or that the firebenders did. I just think its wrong to assume for the reasons that you've given that such was the case. The moon was always there as soon as the earth was, and witht the earth came water, which the moon pushed and pulled So water. But the earth was there as well, it just took a little longer to form. So earth. The sun was there before any of those things, but there was nothing on the earth to use firebending, except for the early people.....So fire. By now the earths atmosphere has been created and wind is taking place. So air. Last edited by Renori Fa on Sat Oct 11, 2008 11:33 pm, edited 1 time in total. That's your assumtion and theory but its not a fact. The first firebender was a dragon and the moon was the first waterbender. The moon came before dragons. Don't change the rules of the avatar world. The sun's fishion can exist all it wants but the fact is that firebenders learned from the dragons, not the sun. If dragons learned firebending from the sun, then the sun would be the first firebender, not dragons. and we all know that's not true. That's not just me it's the facts of the avatar world. Last edited by WaterBending_Monk on Sat Oct 11, 2008 5:13 am, edited 1 time in total. Location: In the Northern Water Tribe. The suns fishion doesn't count as firebending, thats the thing. You can't go against what the show is saying. The sun was not the first firbender. I'm suprised I never thought of this but the moon did exist before the original benders. As much as I love earth, water definetly came first. The only thing you just proved is that FIRE came before waterbending, but actual firebending didn't come before waterbending. Fire existed before the moon pushed and pulled the tides, that's all. Firebenders learned firebending from dragons and since the dragons came after the moon then waterbending came first. I'll be a big person and admit that you are absolutely right that the sun and fire came before the moon, and now you have to be big about this and admit waterbending came before firebending. This just proves my point more that waterbending came first. Fire, in general, existed before waterbending, but firebending itself didn't come before the moon. Also just like I said many times already: The moon existed before dragons, badger moles and airbison and since none of those creatures are older than the moon......technically waterbending came first. (unless someone can name a dragon, badger mole or airbison that is older than the moon.) 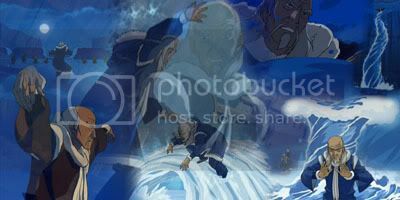 The only thing you can debate on now is weather the first humans learned waterbending first. Like I said, it is very likely the first benders were waterbenders because we all just proved that waterbending came first lol. thenations: thank you for proving my point in further detail. Last edited by WaterBending_Monk on Sat Oct 11, 2008 11:45 am, edited 1 time in total. ~Waterbending_Monk wrote: This just proves my point more that waterbending came first. Fire, in general, existed before waterbending, but firebending itself didn't come before the moon. But Firebending is more than moving fire, remember? It's the ability to create it as well. While fission is very different from oxidation, the Sun's fire is close enough for the Avatarverse's limited knowledge of the heavens. Therefore, since the Sun is creating "fire", it has to be firebending. I could also make the argument that the moon is not truly "waterbending". Waterbending is made possible only by spiritual power. The tide is caused by gravity. Absolutely no spirituality needed to cause it. Therefore, by your logic, the moon was not really waterbending. But I never wanted to establish that Firebenders came first. I wanted to establish that your logic does not provide enough to assume that the Avatar came from the first element to be bended at all. That's why I used my theory in the way I did. I'm not trying to prove that Firebending came first. I'm trying to show you with possible counter-examples why its not safe to assume that Waterbending came first. My ultimate point is that, even if Waterbending came first, that's no guarantee that that's where the first Avatar came from. Somehow, it seems to me that the Great Spirits that made such a decision (if the decision was ever made by anyone) would hardly count the age of a Bending type as a measure of which Nation the Avatar should originate. So no, I don't think that it "just makes sense" that the type of Bending that has been around longest gets the Avatar. I'm sorry, but that doesn't make any sense to me at all. I can think of many possible reasons that wouldn't be a good criteria to base it off of. *sighs*.....oh my dearest Dark_pleh. Even with everyone proving waterbending came first you still wont accept it. your hopeless in debates lol. I even admitted you were right with your findings and you still didn't give everyone the time of day to just admit waterbending came first. Your dead wrong. It's not firebending. It's just something natural creating fire. It's fire, not firebending. The sun was not the first firebender. Unless you are one of the co-creators of avatar and you just changed the fact that dragons were the first firebenders into the sun being the first firebender. Waterbending_monk and powerofinsanity are right. Waterbending did come first. Bending started with waterbending. ^I agree with you, but I also disagree with what you said about Pleh. Pleh is fun to debate with, he usually dosent have the popular idea and it stirrs up people. But I still think that it went water, earth, fire, air. And the lion turtle said there was an era before the avatar, so the avatar was probably created by some kind of spirit or something. The spirits probably put the avatar in the nation that were the first benders, being water. Then it just moved on to earth, fire, and air. I'm not trying to say that waterbending didn't come first or that the first Avatar didn't come from the water tribe. My point was that, regardless of whether waterbending came first or not, it doesn't make that big of a difference to me so far as the origin of the Avatar. To me, it makes more intuitive sense that the primary factor for discerning the origin of the Avatar have less to do with culture or a nation and much more to do with an individual's state and personality. That being said, the person would need to be an Arbiter by personality. An arbiter must be passive and wise. The Air Nomads were by far the most passive, yet the Water Tribes were most wise. So I do believe that the Water Tribe has strong potential as the home of the first Avatar, but by a different line of thought that I feel uses less assumptions and more facts. Do you see my point yet? It's not so much your conclusion that I'm having trouble with so much as your logic and your method. I simply think there are better ways to logically conclude this train of thought. Last edited by Pleh on Tue Oct 14, 2008 6:48 am, edited 1 time in total. yup, the introduction of the show after all does say: water, earth, fire, air. AND that is how the avatar cycle goes to. And like I've said a million times there is no creature older than the moon so technically waterbending came first. Unless someone can prove there is a bender older than the moon, which noone can. And we already established that even if the sun came before the moon it doesn't count as firebending because the sun was not the first firebender. Bending definetly started with waterbending. "It's not enough that I succeed - others must fail." Yeah the air bison were the first airbenders and they aren't older than the moon. Yup yup, waterbending it is. Yep thats what I thought, so if the waterbenders are really the firsts one then what do you think is the last bending that started? Hmmm, that's hard to say. It was a little easier to figure out where bending started but where it ended is tougher. I would say since water and earth are physical elements then most likely earth came next. Also since most likely the earth was around just as long as the moon then that means the badger moles probably existed next. Which means humans probably learned earthbending next. As for the third and last elements I'm really not sure. It's really up to what existed first: The dragons or the airbison. Although now that water came first and it seems earth probably came second why not just simply follow the cycle like the show has? Water, earth, fire and air. 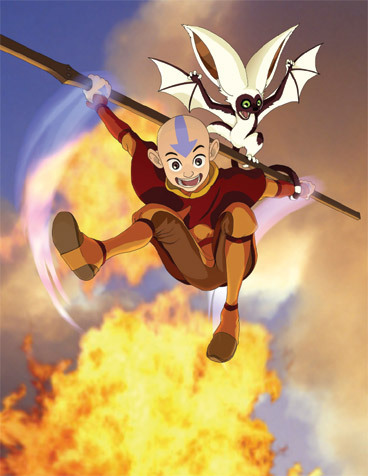 I will even bet you that the creators of avatar put thought into which bending came first to last and purposly put water, earth, fire and air in the intro to show which bending came first to last. If thats the case air was last to be taught. If not, fire was last cause it only seems fair that the two physical elements come first. Last edited by WaterBending_Monk on Wed Oct 15, 2008 6:40 am, edited 1 time in total. Yea thats more likely. Animals probably came after the key elements. Water, air etc. I don't think watar would stay a liquid on a planet without an atmosphere. The atmosphere is one of the first things present on a planet when it first forms. So it would be Earth, then Air, then Water. However fire would more then likely be created at the same time as Earth, since a molten earth would most certainly created fire somewhere. It all hapened at once thats how a circle is, wait when you draw it... wait when did the avatar start? why am i here? The lion Turtle Explains all "before the era of the avatar, we bent not the elements but the energy within our selves" so bending originated from energy bending. now i think that element bending is energy bending being converted into substance so it can interact at the physical level and not just the energy level. and it was the animals that did this first, and then the humans learn off them. Naw. Soulbending has only been seen to take away bending. I see no valid reason to suspect that it is the direct cause of element bending other than opinion. Besides, if Avatar turned out to be just the same story as Naruto in a Nickelodeon wrapper, I would be highly upset. one person finding out that there was bending and started it. I dont know!?! If you don't know, you don't have to post about it. The people who "found out about bending" saw the animals and the moon doing it first and found ways to do it themselves. What we don't know is what order they were discovered in.